The latter part of recent years featured an influx of big power box mods, some claiming power levels of 250W or more. Earlier in vaping, 30W box mods were considered as having big power. It didn’t take long to escalate, that’s for sure. 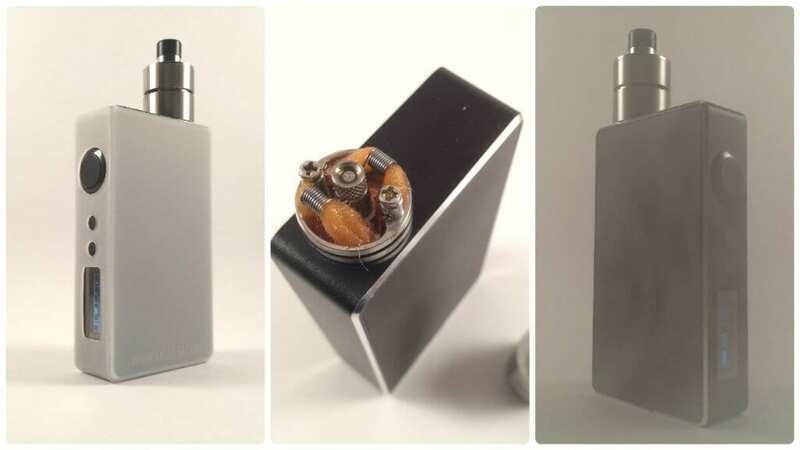 As the “cloud chasing” trend fully emerged, manufacturers paid attention and dropped numerous high wattage box mods onto the market. On an editorial side note, I believe that however you choose to vape is the right way for you. I’m a frequent visitor and active participant on several vaping forums and all too often see vapers being critical of how others vape. I’m not a fan of this behavior and you won’t catch me judging how others choose to get their vape on. Infighting within the vaping community is the last thing we need. Additionally, I will also not directly address the issue of whether or not high power vaping is potentially more harmful than vaping at lower power levels. The facts simply aren’t out there yet. Vaping at any power level likely carries some risk – it is a mechanism for smoking cessation and harm reduction and should be viewed as such. Most things in life come with some inherent risk and it’s up to each individual to decide if their chosen activities or in this case, their preferred vaping methods, come with an acceptable risk. For those interested in reading more on this subject, please follow the work of Dr. Farsalinos. Okay, back to the topic at hand. 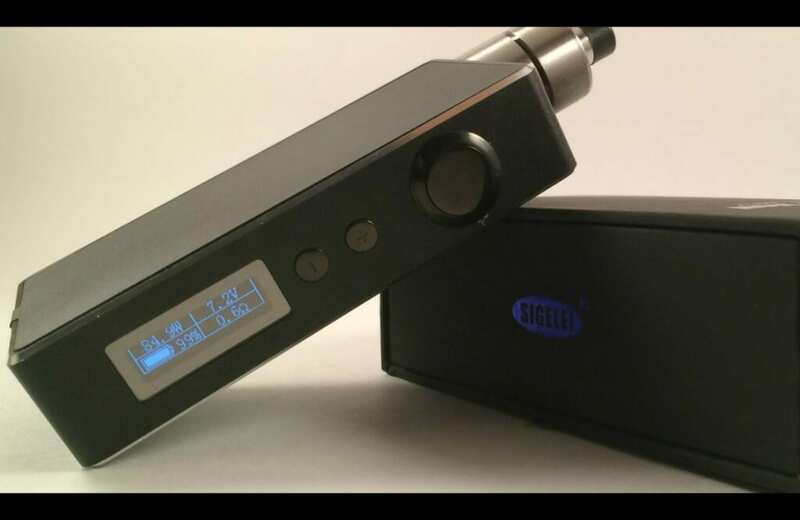 The subject of this review is the Sigelei 150 box mod, a 150W dual 18650 powerhouse. I’m no stranger to Sigelei’s big power boxes, having previously owned a Sigelei 100 and Sigelei 100 Plus. Both were excellent devices. Does the Sigelei 150w continue the trend? Let’s find out. 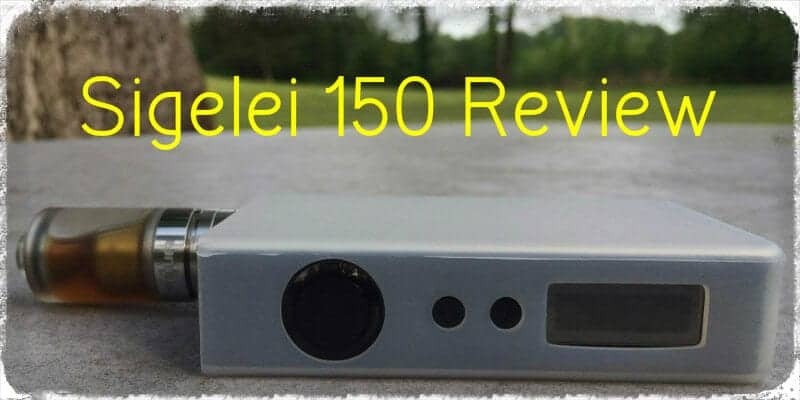 The Sigelei 150 used for this review was provided by Gearbest. 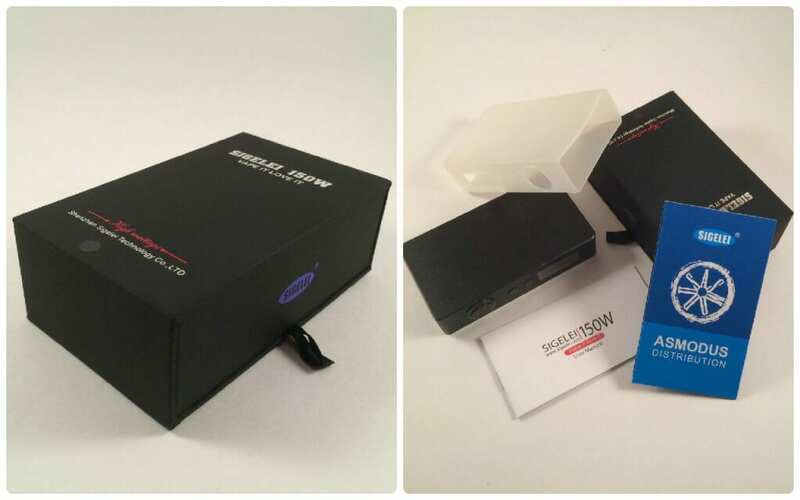 The Sigelei 150 is packaged in an attractive box with a slide out tray. The contents include the device, a clear silicon protective sleeve, a user manual, and an Asmodus warranty card. Asmodus is the US based distributor and provider of warranty service. The device carries a 3 month warranty. The Sigelei 150 is a nicely constructed box mod. Although fairly big, as is the case with most dual battery devices, it is comfortable to handle, especially with the silicon sleeve on the device. The black finish on this example is uniformly applied and without any noticeable defects. Silver beveling highlights the edges of the box resulting in a simple but attractive aesthetic. No button rattle is present and each button has a slight tactile “click” when engaged. It should be noted that a common complaint with the Sigelei 150 is a loose/rattling/spinning firing button. The trim around the button apparently has a tendency to loosen over time causing the firing button to rattle and sometimes stick in the firing position. The unit I received for review has some traces of hot glue around the button ring, perhaps indicating Sigelei is aware of and has addressed the issue. During the two weeks I used the mod the firing button never exhibited any problems. Externally, in addition to the large firing button and two smaller wattage adjustments buttons, you will find the OLED display screen, battery venting slots on the bottom of the device, and a spring loaded 510 connector on top. The battery door is secured by four magnets and is very easy to remove by using the tab at the bottom of the door. The door snaps back into place very convincingly due to the fairly strong door magnets. The internals are tidy and all of the working bits are enclosed in a plastic shroud. The battery sled features polarity indicators to ensure you insert your batteries in the proper orientation – note that the batteries are in a series configuration rather than a parallel configuration. 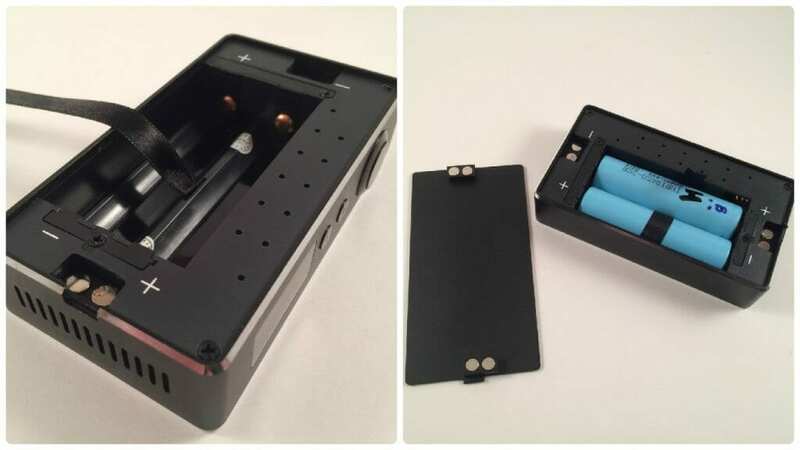 The battery contacts are spring loaded and the battery sled has a built in battery ribbon to assist in removing the cells when they need to be charged. This device does not have on-board charging so the batteries must be removed and charged in an external battery charger. The Sigelei 150w is very well constructed device and shows an attention to detail both externally and internally, save for the traces of hot glue around the firing button ring. The Sigelei 150 doesn’t have very many bells and whistles relative to its usage. There is no menu system, just the simple display layout which provides current power setting, atomizer resistance, remaining battery life expressed as a percentage, and output voltage. Pressing the firing button five times will turn the device on or off. Wattage is adjusted using the small up and down buttons. Wattage adjusts in 0.1W increments up to 50W and then increments by 1W up to the 150W maximum. Holding down either of the wattage adjustment buttons for a few seconds will result in accelerated adjustments. The device can be locked by simultaneously pressing the up and down buttons. How does the Sigelei 150 perform? Like a beast, that’s how. I used the device with two different atomizers – an MMV OverOne RDA for high power testing and a Footoon Aqua V2 RTA for battery life testing. In both cases, the Sig 150 performed well. I did not venture up to the 150W maximum, largely because the 0.6Ω build in the OverOne wasn’t within the operating parameters to achieve maximum power output. I’ll discuss that more in a bit. I did run it at an indicated 100W but due to some inaccuracies of the board and my 0.6Ω build, I was really only hitting about 75W. Regardless, it was making some fog. Running the Sigelei 150 at 23W with my Aqua V2 was an impressive exercise in battery life. Although I didn’t benchmark the usage times or battery run times, suffice it to say the batteries last a really, really long time at conservative power levels. I wasn’t using the Sigelei 150 exclusively during testing but I did use it regularly throughout the day and went several days between charges using the Aqua V2. Now, let’s discuss the operating parameters of the Sigelei 150. The Sigelei 150 uses dual 18650 batteries in a series configuration. This means the battery output voltage is doubled while the maximum continuous drain rate (CDR) remains the same. In the case of my Samsung 25R batteries, the CDR is 20A. Fully charged, battery output voltage is 8.4V. I won’t digress into a full blown dissertation on how Ohm’s Law applies to regulated, variable wattage (VW) devices but will cover some general information. Too often, I see folks on various vaping forums applying unregulated Ohm’s Law calculations to regulated, VW mods. To quote a recent TV commercial, “That’s not how this works, that’s not how any of this works”. In a nutshell, unlike a mechanical mod, atomizer resistance has no bearing on battery current drain (amp draw) – it only affects the board’s output voltage and output current as you’ll see below. The battery current drain is determined by the mod’s power setting and the real-time voltage of your batteries. For the examples below, I’m using screenshots from the excellent Steam Engine tool created by Lars Simonsen. I’m also assuming an APV efficiency value of 93%. I don’t know the actual value for the Sig 150 but it is likely in that neighborhood. APV efficiency is just what it sounds like – how efficiently the board turns battery input power into output power. 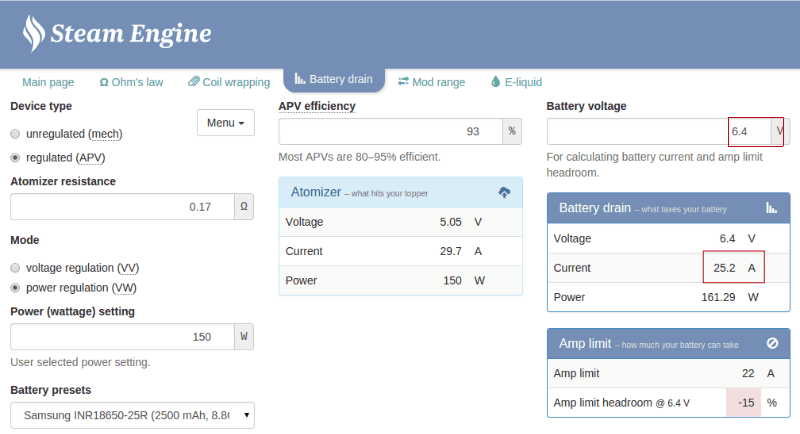 First, let’s look at how atomizer resistance affects the usable power range. The Sigelei 150 has maximum output voltage limit of 7.5V and maximum output current of 30A. In order to remain at or below the 7.5V and 30A thresholds, your atomizer resistance must fall between 0.17Ω and ~0.37Ω. As atomizer resistance increases, output voltage also increases. As atomizer resistance decreases, output current increases. Relevant values are highlighted below using an example resistance of 0.37Ω. I encourage you to use this tool and play around with the values to get an idea of your device’s limitations and how the values relate to each other. Now, let’s cover battery current drain. As previously noted, your power setting and real-time battery voltage are what determine your battery current drain. For the first example, let’s see what’s going with a fully charged pair of Samsung 25Rs (8.4V) at the maximum power of 150W. 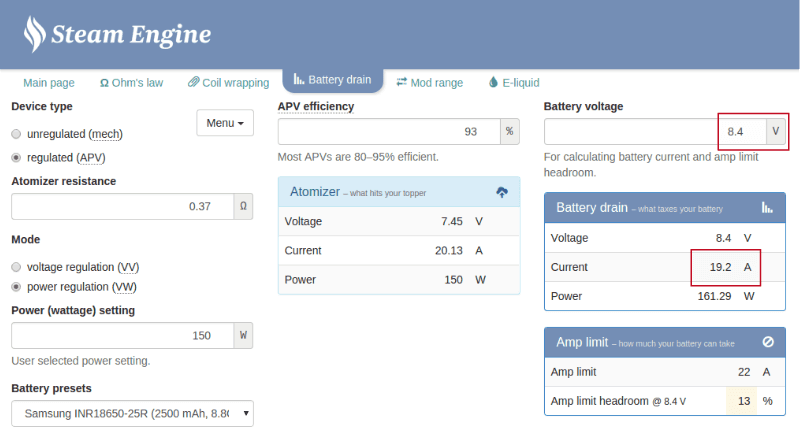 Notice the amp draw is 19.2A, already very near to the CDR limit of the batteries. It is important to understand that as battery voltage decreases, battery current drain increases. At 150W, you are afforded very little voltage loss before unsafe battery drain is achieved. For the sake of the below example, I’m using the Sigelei 150’s low voltage threshold of 6.4V. Notice the battery current drain is now 25.2A, in excess of most batteries maximum CDR. If you are going to run this device at or near maximum power, please use batteries with the appropriate ratings and make sure they are in good condition. 150W is a *lot* of power and running the Sig 150 at that level is asking a lot of your batteries. Safety first, yo. Again, play with the Steam Engine app and plug in different values to see how hard you are working the batteries. Lesson concluded. Now, back to the real life performance of the Sigelei 150. I didn’t perform extensive testing but I did generate a few quick numbers in an attempt to gauge the device’s accuracy. The table below tells the story. I didn’t test beyond 80W since my build was limiting the potential performance. But, you’ll notice that as the power setting increases, accuracy decreases. I don’t consider this a very big deal and, unless you just absolutely have to have every single one of those 150W, neither should you. There is still plenty of power on tap and I just adjusted the power to my preferred taste and temperature. The Sigelei 150 is a well built, powerful mod. I did not experience any problems or failures with the device – none. It performed flawlessly and delivered all the power I could handle along with crazy good battery life. If you are after a high power box and can live with the Sigelei’s inaccuracies and understand you’ll likely not achieve a full 150W, you could do a lot worse than this box. And, to reiterate, the only draw of this mod shouldn’t be the potential power but also the excellent battery life afforded by dual 18650s. Just because the power is there, it doesn’t mean you have to use it. I used the Sigelei 150 much more often with my Aqua V2 at 23W than I did with my dripper at big power numbers. So, in summary, it’s not only a powerhouse fog making monster, it’s also very practical. Sigelei is a brand that’s been creating for some increased buzz and talk in the vaping community lately, and a lot of this has had to do with the company’s latest product - the Sigelei Fuchai 213. The 213 is the latest mod that the company’s released, and it’s shaped up to be a pretty stellar product. The Sigelei may not be a household name just quite yet for all who vape, but after finishing up my Sigelei Fuchai 213 review, it really should be. The company hit some rough waters with the initial launch of the 213, but the mod in its current version is one heck of a product. It’s powerful, sleek, and extremely capable. With all of this being the case, is this the mod to get? Or are you better spending your money with other brands to get a powerful and stylish mod? Keep reading this Fuchai 213 Plus review to find out! It’s a bit difficult to summarize my entire Sigelei 213 Fuchai review in one single paragraph, but the best way for me to describe the mod is something that’s ridiculously powerful with an supremely sleek and stylish design. The 213 is one of the more powerful mods I’ve gotten to play with, and all of that power also comes with excellent vapor/flavor, great battery life, and so much more. There sure is a lot to talk about here, so let’s get into it. To kick off my Sigelei Fuchai 213 Plus review, let’s talk about build quality and design. 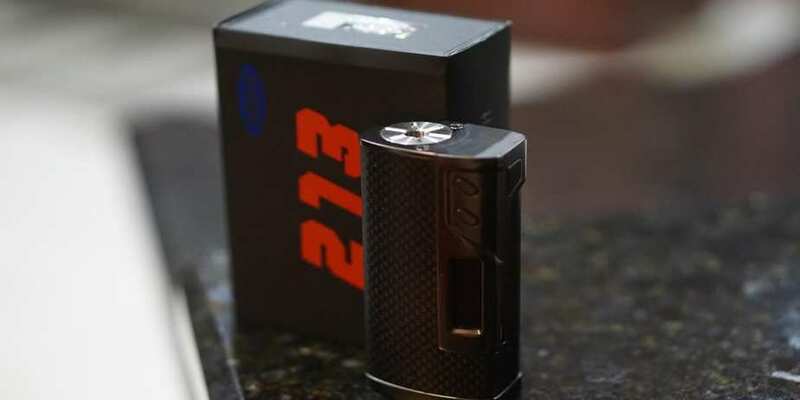 There are tons of good-looking and well-built mods that you can currently buy, and while it’s becoming increasingly difficult for mods to do this, Sigelei has somehow found a way around this with the Fuchai 213. 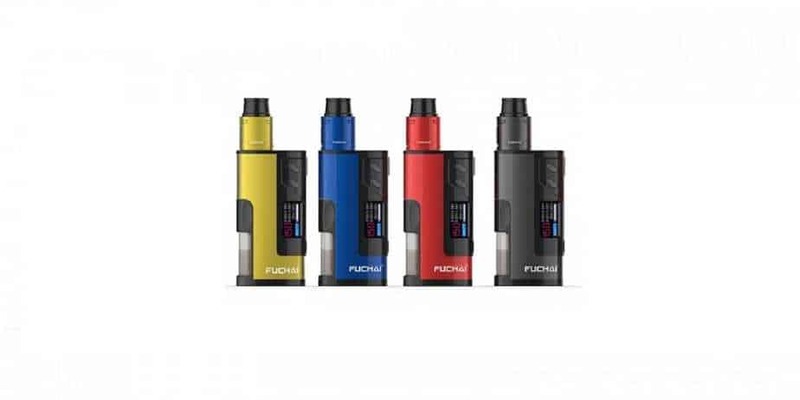 The Fuchai 213 is available in a handful of different colors, and the overall look that’s present here is extremely sleek and stylish. The overall aesthetics are quite subdued and laid back, but this creates for a mod that looks quit elegant. And where it lacks in flashy design, the 213 easily makes up for that with a great handling experience. One issue that Sigelei had with the first version of the 213 had to do with a weak battery door, but thankfully that issue appears to have finally be fixed. The battery door on the latest version of the 213 feels incredibly secure and sturdy, and this can really be said about the entire mod. The Fuchai 213 offers a tank-like design and build construction in addition to its good looks, and this is a combination that I’m an absolute sucker for. Another area where Sigelei improved the new version of the 213 over the old one has to do with battery life. The former Fuchai 213 didn’t offer necessarily poor battery life, but Sigelei went ahead and improved it even more with the latest release of the 213. Even when using the mod at higher wattages and temperatures, you can still expect some good endurance out of this thing. One big highlight for me while working on the Sigelei Fuchai 213 temperature control box mod review has to do with just how great the vapor and flavor quality is with the Fuchai 213. This is an area that Sigelei has been proving their expertise in with their latest products, and it’s very much so evident with the new Fuchai 213. The flavor you’re able to get out of this mod tastes nice and smooth without being too powerful, and the v﻿apor cl﻿ouds you can create also manage to get quite big with the right settings applied. These might sound like simple things, but being able to get a mod that excels with a nice design, great battery life, and awesome flavor and vapor quality really does create for the perfect trifecta. No matter how you look at it, the Fuchai 213 is overpriced when you consider everything it’s bringing to the table and the competition that currently exists for it. That’s not to say that the 213 is a bad mod, as it’s actually a very well-made and executed one. However, if you do a bit of shopping, it is possible to find other mods that will offer similar experiences for a bit less cash. You might not get that same build quality or power output, but if you’d like to save a bit of money, you can get very similar experiences with mods that don’t cost nearly as much. On the front of the Fuchai 213 is where you’ll find a display that’s used to display any settings or tweaks you’ve made to the mod, and this serves as a great way to see all of your custom preferences. The screen isn’t necessarily the brightest that I’ve ever seen on a mod of this price range, but it’s a heck of a lot better than most of the competition out there. Mods like the Reuleaux RX200S still range supreme in this category, but the 213’s display still has a lot to offer and should create for a pleasant viewing experience for most people. 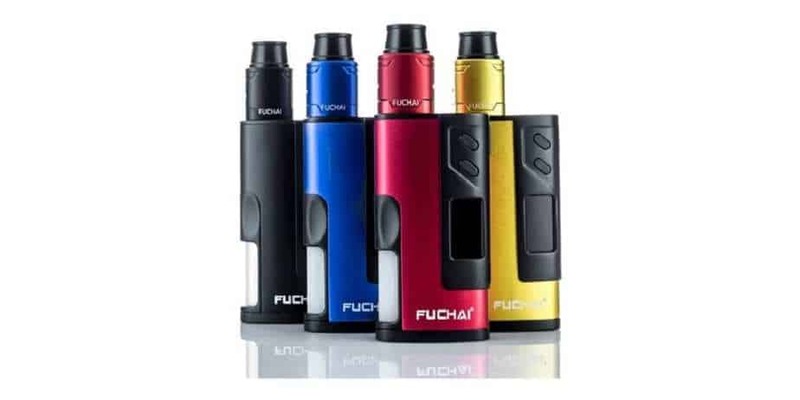 As the name of the Fuchai 213 suggests, the mod is capable of a power output up to 213W. This is something that I was very anxious to try when I first started working on my review, and I’m pleased to report that I didn’t experience any sort of issues when cranking the 213 up to its max power settings. This is something that the original version of the 213 had trouble with, but the revised model didn’t pose any sort of problems. Being able to reach a power output of 213W on a mod this size really is impressive, and even better is the fact that the mod stays comfortable (albeit a touch warm) when vaping at this setting. 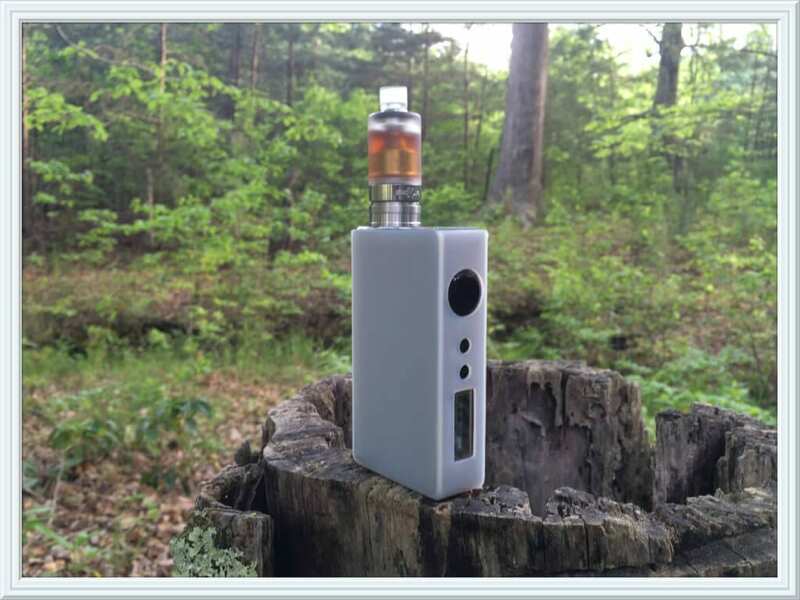 So, to wrap all of this up, where does that leave us with this Fuchai 213 review? If you’d like to save a few dollars, you can find other vapes for less money that will deliver a similar experience. However, if money isn’t an obstacle, there’s a whole lot to like about the Fuchai 213. This is a mod with a lot of power, great looks, a fantastic build, excellent vapor quality, and long battery life. If you’ve got the cash to cover the cost, you won’t be disappointed with this one. We’ll cover our first impressions, building and wicking the included RDA, usage, performance, pros and cons, and conclude with whether or not we recommend the Sigelei Fuchai Squonk 213 150w Kit! Now onto the performance of the included RDA. As mentioned previously, it does have side airflow, which is not adjustable and it is quite airy for me personally. It performs fine, but it’s not going mind blowing and I wasn’t expecting it to be. The flavor is decent, and the vapor production is great. I’ve been personally using this device more with a single coil RDA such as the Pulse 24 BF RDA, which not only gives me better battery life due to it being a single coil, but much better performance as well. Honestly, I think this kit should’ve included a single coil RDA rather than dual coil as it’s more fitting for a single battery regulated squonk box mod. Excellent review Sir, well done , you covered the negatives , the yet to be known possible health consequences of high power vaping and the benefits of high power vaping , very impressed. I believe this model is on it’s way out and prices should be much more reasonable in the coming weeks . That is because i believe the vast majority of mods are coming out with temp control. 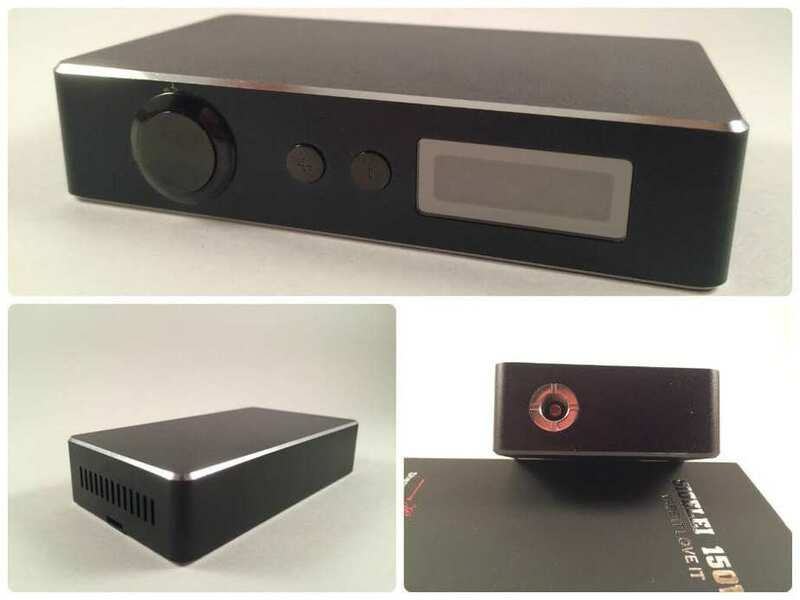 P4U is using the iPV III enclosure and introduced a temp controlled high power chip in it and i expect Sig to follow since their linked . Thanks very much for your positive feedback. Stay tuned, my next review is the IPV4 – 100W and temp control. I got one of these about a month ago and am very happy. My main focus was longer battery life and it comes through like a champ. I have two minor cons with it however. First the screen is far too small. I suspect screen size will be the next big innovation in regulated mods. Second, setting wattage up and down is far too sensitive. There seems to be a less than one second delay between slow increments and super fast. Trying to, say, move from 30W to 40W becomes an exercise in frustration as the device will speed through its setting far to fast. Aside from these quibbles I’m happy with my Sigelei. More than enough power for however yo vape and exceptional battery life.